Penny Arcade has teamed up once again with ESRB to create a series of print and online ads informing parents about game rating systems. 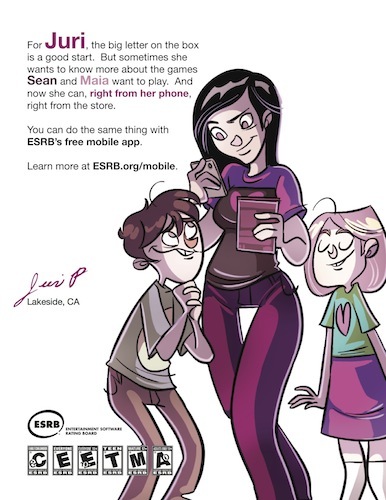 The caricatures in the ads are based on real parents and their kids, and they highlight new features like the ESRB ratings summaries and the ESRB mobile app. According to the ads page, the last time Penny Arcade worked with the ESRB was 2006. So much has changed since then. Facebook, Twitter, and Youtube have practically become fixtures, and almost everyone with young children these days have grown up with video games. It makes you wonder if this moral panic over video games has passed.